Can you train to become a Virtual Tutor? could you do with some additional income! Teaching and Learning has changed! or a teacher wanting to work from anywhere. This two day workshop will enable you to follow procedure, e-monitor, e-mentor and e-access your students progress and help them to complete their online course using a cutting edge Learning Management System. Statistics have shown that institutions of higher learning increasingly embrace online education, with 65.5 percent of chief academic officers now calling online education ‘critical’ to their institutions! long-term strategy, an opinion that’s risen more than 15% over eight years. After you qualify you will be able to work with our students online as a one of our Virtual Tutor Facilitators using your Global Accredited certificate by the IAO. Turning 50 isn’t the end of a business career – it’s the beginning. And an ever-growing wave of ‘olderpreneurs’, starting a business have 70% chance of surviving their first five years compared with only a 28% survival rate for those younger than them. Nearly half the self-employment population is over 50, and one in six new businesses started in the UK are set up by post-half-centurions. So what’s fuelling the entrepreneurial impetus of the ‘silver startup’, and why are they doing so well? The over-50s age group has been particularly hard-hit by the recession. Last year, the Office of National Statistics (ONS) revealed 28% of those aged between 50 and state pension age were out of work – compared with only 20% of those aged under 50. Why? One of the biggest factors is the rife ageism that permeates practically every industry in the UK, that anyone over 50 who’s been forced to look for employment will testify to with a weary nod. The ONS estimates those who lose their job aged 50 or over have only a 10% chance of being re-employed. Deciding to use their money from redundancies to fund ta company, over the course of two years the payout had trickled in its entirety into the business. But it was worth the investment – and they often don’t have to rely on the ineffective banks at the moment. At a fundamental level, sometimes people just want to do something different in their later years. It’s interesting that recent YouGov and Standard Life research found the average age at which people feel totally confident in their working skills is 37, while the more elusive sense of fulfilment peaks at 50. Perhaps this climax of achievement and sense of ability leads to a need for a new direction, a new challenge, once a person passes the half-century mark. the number of economically inactive people, aged from 16 to 64, fell by 13,000.
the number of economically inactive people, aged from 16 to 64, fell by 75,000.
the total number of people in employment increased by 552,000, the largest annual increase since 1989. The unemployment rate for September to November 2012 was 7.7% of the economically active population, down 0.1 on June to August 2012 and down 0.7 on a year earlier. The number of unemployed men aged 16 and over fell by 37,000 between June to August and September to November 2012 to reach 1.41 million, but the number of unemployed women was unchanged at 1.08 million. The number of women unemployed for up to six months increased by 26,000 to reach 571,000. This may reflect changes to the benefits system resulting in more single mothers starting to look for work (see Claimant Count section of this Bulletin for further details). The economic inactivity rate for those aged from 16 to 64 for September to November 2012 was 22.5%, unchanged on June to August 2012 but down 0.7 on a year earlier. The number of economically inactive people aged from 16 to 64 fell by 13,000 between June to August and September to November 2012 to reach 9.03 million. The number of people claiming Jobseeker’s Allowance fell by 12,100 between November and December 2012 to reach 1.56 million. Between July to September 2012 and October to December 2012, the number of vacancies increased by 10,000 to reach 494,000. This is the highest number of vacancies since October to December 2008, but it is 200,000 lower than the pre-recession peak of 694,000 recorded for January to March 2008. Between September to November 2011 and September to November 2012, total pay for employees in Great Britain rose by 1.5%. This annual growth rate for earnings was lower than the increase of 2.7% in the Consumer Prices Index between November 2011 and November 2012. The ultimate course that over an intense and amazing week will develop all the skills necessary to work around the world training new Virtual Tutor Facilitator in their new career. Course topics include: Advanced Facilitation, Body Language, Teaching & Learning Skills, Mediation, Communication, Presentation Excellence and Assessment and online LMS systems. It is brand new and uses all the latest techniques, theory and experience to deliver simply the best training course (train the trainer) out there. Graduates will get to spend a full day shadowing the professionals and learning the insight track for delivering excellence in learning. 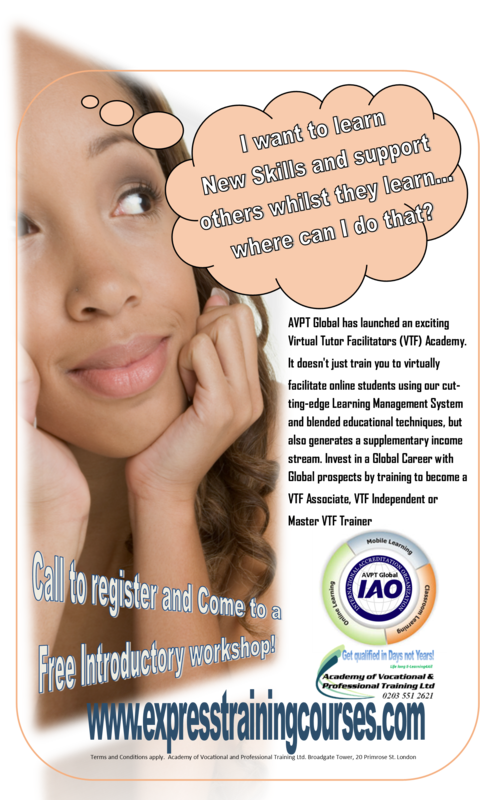 The course will allow the trainers to deliver the workshops anywhere in the world having gained their IAO global accredited certificate. The demand for such a course has been intense and we are delight to be taking enquiries and reservations for the first course dates. Become the best in the field, be the person you want to be and never except anything less than excellence.